In a moment of weakness last night, I texted my ex-Jeep’s new owner—you know, just to see how things were going. What I learned is that, as much as I miss that beautiful 4.0-liter manual transmission XJ, it doesn’t look like it misses me. It looks genuinely happy. About a year ago, I made the tough decision to part ways with undoubtedly the most gorgeous vehicle in my collection—a 1996 Jeep Cherokee. Unlike every other Jeep I own, this one had no rust and a beautiful coat of paint. Plus, it had the coveted AX-15 five-speed manual transmission. But beauty and that manual trans just weren’t enough; despite having spent hours replacing its cylinder head, steering components and lots of other parts, I still didn’t feel a connection. That’s when Kevin, the new owner, told me all the amazing things he was doing with the XJ. He bolted up a new Zone three-inch lift kit, replacing the crappy rear blocks, overly stiff springs and garbage shocks the Jeep used to sit on when it was under my ownership. He also swapped the engine mounts and trans mounts with top-quality Brown Dog ones, threw on an adjustable track bar, shimmed the caster on the lower control arms, put in new sway bar end links, and replaced the intermediate steering shaft. On top of that, he’s thrown on some awesome alloy wheels with 31-inch Mickey Thompson all-terrain tires, replaced the battery cables and starter, purchased a new Magnaflow exhaust and a new O2 sensor, and has plans to install a slip yoke eliminator (which helps keep down the lifted Jeep’s driveline vibrations), 3.55 axles with a rear disc conversion and upgraded front calipers. In other words, Kevin is installing tasteful mods, just as the Jeep gods intended. On top of all that, he’s actually got a “work log,” which details the mileage and dates that certain parts/fluids were replaced. And he just got back from taking the white XJ off-roading in Shawnee National Forest. Basically, Kevin is giving the Jeep all the love I could never give it: the expensive (but necessary) mechanical parts, the beautiful wheel and tires, and the hours of meticulously-logged service. Unfortunately, with my huge collection, I couldn’t give the white Jeep enough attention, so I neglected it. It never got the lift kit it deserved. It never got the proper tires is needed. It rode on bad shocks, and had sway bar links that were too short. Plus, lord knows I couldn’t maintain a maintenance log if I tried. 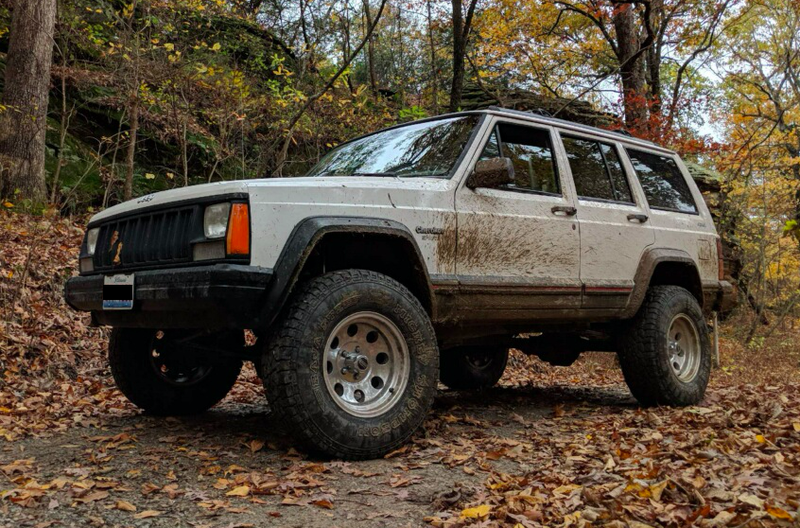 My Jeep deserved better, and seeing it in these pictures—clearly happy, with new shoes, and mud-covering its gorgeous paint—has helped me come to terms with my decision to sell the boxy beauty. As long as the XJ is happy, then I am, too.